For times when you need to feed your baby on the go, this bottle warmer makes it possible to warm your milk anytime, anywhere. Boiled water in the thermos flask stays hot for up to 6 hours and bottles can be warmed within 2.5minutes. The bottle warmer can warm 6oz milk in just 2.5 minutes*. 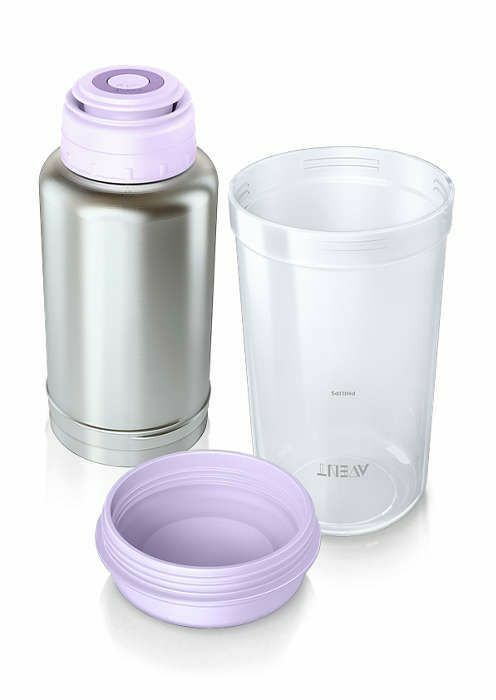 The easy pouring lid is designed for no spills on the go. It has clear open and close positions and is easy to clean. 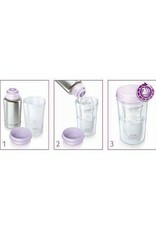 The protective lid on the beaker keeps the baby bottle safely inside to ensure fast, safe warming. 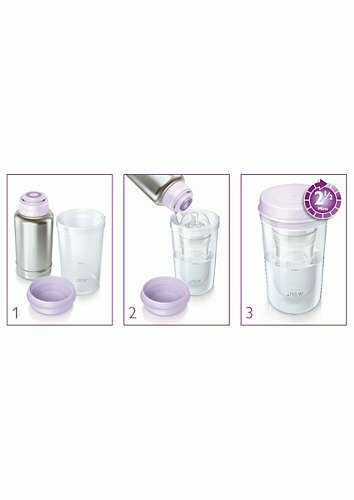 On the beaker a warming reference guide is included, which indicates for all Philips Avent bottle sizes how long they should be warmed, depending on the temperature of the milk. 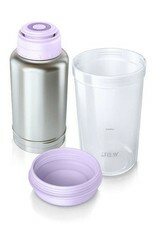 Heat up multiple bottles with hot water from one pre-filled thermal flask (500 ml). No power needed. This is the bottle warmer that you can take anywhere with you. Boiled water in the thermos flask stays hot for up to 6 hours and can be used to warm multiple bottles. Simply place the bottle in the beaker, pop open the pouring lid of the pre-filled thermos flask and pour the hot water into the beaker. Screw the lid on the beaker for fast, easy and safe baby bottle warming.